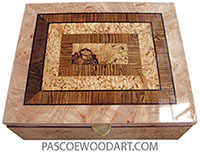 11-3/4" x 8-15/16" x 2-7/8"
This box is made of heavy Asian ebony veneer laminated over cherry. 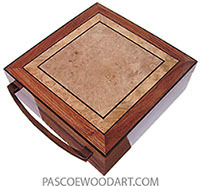 Top has a Honduras rosewood and Asian ebony parquet inlay in a solid ebony frame. Box is sized to hold letter sized paper, if desired. 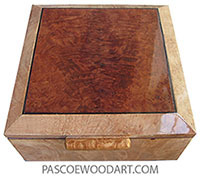 Satin acrylic finish is heavy and and grain filling and very durable. Last updated May 28, 2010. Posted May 17, 2010.